How A Simple Bump Can Cause An Insidious Brain Injury : Shots - Health News Hundreds of thousands of people suffer brain injuries each year. Sometimes the damage is caused by something that seems innocuous, like a stumble or a bump on the head. When should you see a doctor? So it's ironic that the brain injury he failed to diagnose was his own. And he could have died from it. "It's a pain I've had before," says Arling, who has battled back problems for years. "But it was more intense than I've ever had it before." "Then I began noticing that I was shuffling. I was so weak I couldn't carry my plate out to the back deck. I would just drop things. And everybody commented on how I seemed different," he says. "I could make sense of things, I could get things done, I could make decisions," he says. "But I was slower at what I did." Arling thought he was having trouble focusing because his back pain was so intense. So a neurosurgeon, who had treated Arling's back problems before, ordered an MRI of Arling's spine — and also his brain. When the MRI technician saw Arling's pictures taking shape on his screen, he called the radiologist and said, "You need to see this right away." The images showed a big, white, lake-like shape where Arling's brain should have been, inside the top right side of his skull. It was a pool of blood that was pushing down on the brain, causing it to shift from right to left. 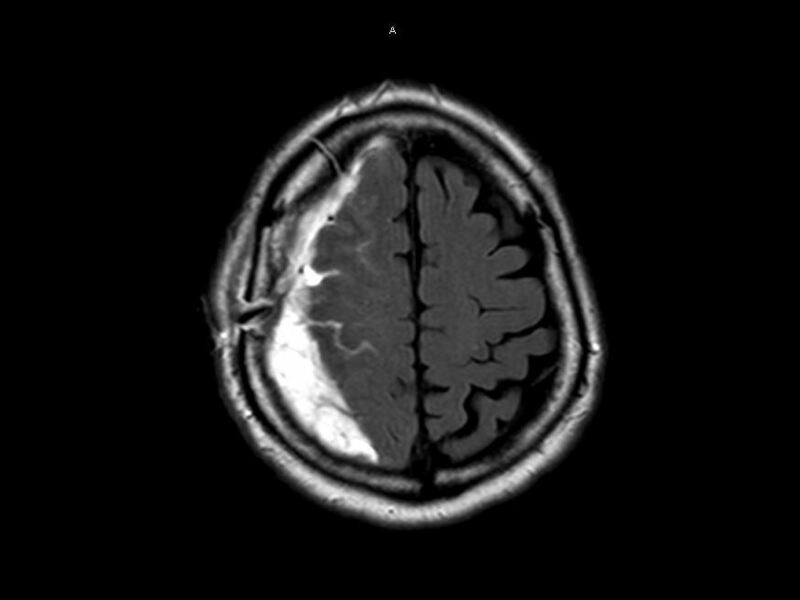 An MRI scan shows Bryan Arling's brain from above. The white-looking fluid is a subdural hematoma, or a collection of blood, that pushed part of his brain away from the skull, causing headaches and slowing his decision-making. "And I said, 'I haven't fallen,' " Arling says. Then, just as they were wheeling him into the operating room, Arling remembered: The day he stood up in the attic and threw out his back, he had forgotten he was under the eaves, and had knocked the top of his head against a wood beam. But he didn't even get a cut, so he forgot about it. Everybody knows you can get hurt if you fall off a ladder, or slip and bash your head on the ice. But Arling got a kind of brain injury that's usually more insidious — a subdural hematoma. A subdural hematoma is different from the typical blast injuries that affected hundreds of thousands of U.S. troops in Iraq and Afghanistan. In those cases, shock waves rattled their brains and caused microscopic damage that's hard or impossible to detect. It's also different from the usual football concussions, in which blows to the head damage the brain's electrical wiring. The main population at risk for a subdural hematoma is the elderly. To understand why, it helps to picture an aging brain. The brain is wrapped and protected by a membrane called the dura mater. Inside the dura, there's a network of veins that connect it to the surface of the brain. Any cognitive changes: You feel, or people say you seem, "different." Studies suggest that as you get older, your brain shrinks and pulls away from the dura, especially after you're 60 or 70 years old. But the veins keep holding on to both the dura and the brain. So as your brain pulls away, some of those veins become more exposed and more vulnerable. Researchers say if you simply bump your head on the eaves of your attic, as Arling did, or if you simply start to fall and then catch yourself — so your head doesn't strike anything, but it jerks in the air — that can be enough force to jostle your shrinking brain. "And those veins stretch, and you'll get tearing in those veins," says Dr. David Cifu, who runs a joint research project studying brain injuries for the departments of Defense and Veterans Affairs. And because blood from veins tends to ooze, instead of pump as it does from arteries, Cifu says, "when the veins tear, we get a very low-pressure ribbon of blood that's layering on top of the surface of the brain." As that blood starts to pool over days or weeks, it irritates the brain cells. And if the pool's big enough, it presses on the brain and damages it, much like a tumor. Researchers studied the problem a few years ago at a sample of 20 percent of the nation's hospitals. As they reported in the Journal of Neurosurgery, those hospitals alone diagnosed almost 44,000 subdural hematomas in one year. So the researchers estimate there could be more than 200,000 subdural hematoma injuries diagnosed annually at all the hospitals across the country. 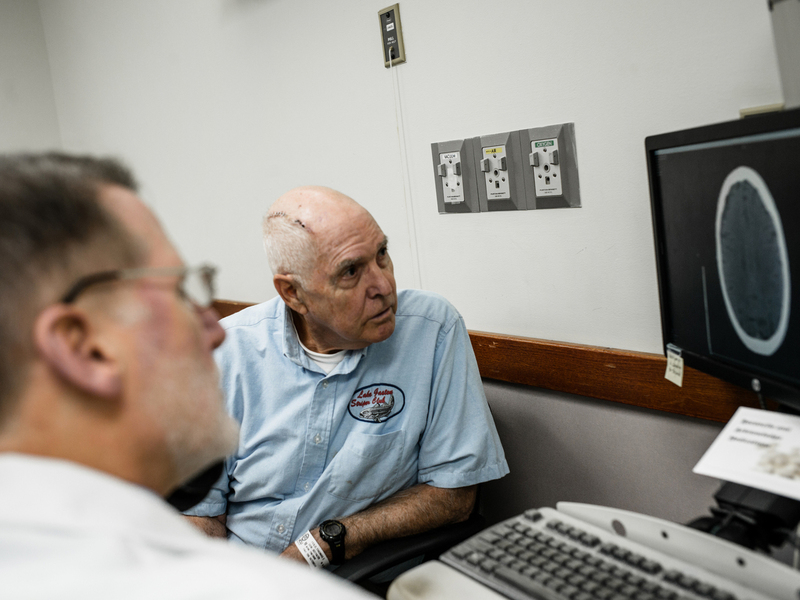 Tom Feild looks at a brain scan with his doctor at Virginia Commonwealth University Medical Center in Richmond, Va. Feild had brain surgery after experiencing a low-grade headache that wouldn't go away and difficulty driving. "It wasn't a constant headache — it was a low-grade headache. But it wouldn't go away," he says. "I said, 'Tom, you're going on their side of the road.' He said, 'I know ... I can't seem to help it,' " Jody Feild says. Tom Feild made an appointment with his local doctor. And the next thing he knew, a helicopter was rushing him to Virginia Commonwealth University Medical Center in Richmond. Neurosurgeon Bill Broaddus drilled three holes into Feild's skull and vacuumed out roughly 8 ounces of blood that had pooled since he developed a subdural hematoma. "We may see 50 to 100 [similar subdural hematomas] here at this institution every year," says Broaddus. Brain specialists say it's important to view these injuries in perspective: Most people who get a subdural hematoma will never know it. The brain will reabsorb the blood, the victim's symptoms will disappear, and life will go on as normal. But for tens of thousands of others, it's serious. Doctors say they often see families who think loved ones are getting dementia, and it turns out they hit their heads and have a bleed. Some victims die. Researchers like Cifu say you don't need to consult a doctor the second you get a headache. But they say it's sensible, and responsible, to follow some simple guidelines: Consult a physician as soon as possible if the headaches don't go away, or if you begin to have trouble with your balance or feel weakness in your legs or arms. Also, if the way you think starts to seem "different," Cifu says. Internist Arling says even if it turns out that you do have a bleed, he's living proof that these brain injuries can be cured if you catch them in time. "It's so easy to come away from a story like mine, and to feel fragile, and so to worry unnecessarily," Arling says. "The body is phenomenally well-designed, and it has a phenomenal ability to heal itself."